It has been revealed that the French First Lady is pregnant. 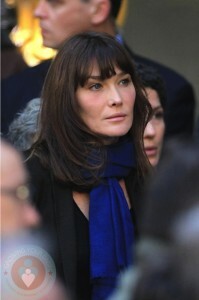 The news of the pregnancy does not come from Carla or husband, but her father-in-law, Pal Sarkozy. Carla has not confirmed or deny the reports of her pregnancy. The couple has managed to keep news of the pending arrival quiet until this recent interview. She was, however, photographed yesterday sporting what could definitely be a bump. Speculation has Carla expecting twins in October.